is a place of free exchange of ideas, inspirations, knowledge and, of course – gems of the publishing art. Let us together immerse in picture books in the green surroundings! During this meeting in the Picture Book Lab series we are going to recline in deckchairs and lie on soft carpets while enjoying homemade cake and conversations about books and not only. 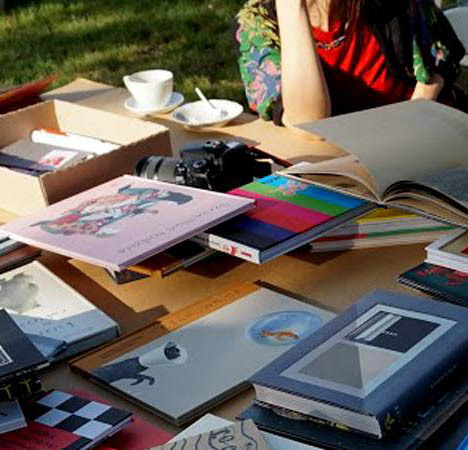 We invite fans / enthusiasts / friends of picture books of all ages – everybody will find a special book for themselves, and the youngest participants will play on a looooong roll of paper stretching on the pavement. Take your books with you – we will gladly “look” at them. Books for Looking is in interdisciplinary project devoted to picture and illustrated books. This joint initiative of Wrocław psychologists, teachers, artists and librarians is intended to make both children and adults able to consciously experience the world of pictures. Its most direct dimension is the world of meanings enclosed in a book. By creating a space for exchanging thoughts and actions, we would like to enrich it together. Kasia Bury of Tekturowo will make her collection available during the meeting.